Davis is a rising star in the 2021 class. Oklahoma State extended an offer Tuesday morning to receiver prospect Quaydarius Davis. Davis is a three-star recruit from Dallas Skyline High School. He is committed to SMU. Though Davis pledged to the Ponies on Dec. 1 of last year, his recruitment hasn’t slowed. He’s up to a half dozen offers and counting, with more likely to come because of his 2021 classification. Davis is a 5-foot-11, 186-pound who is riding the camp circuit high with offers from OSU and Minnesota over the last few weeks. He was a standout at a Dallas Showcase camp two weeks ago, showing off his deep threat ability and quick twitch, and his stock has risen since. Davis is mostly being recruited as a receiver now after catching 29 passes for 702 yards receiving and 8 touchdowns last season, but with his physical profile and speed, defense could be an option at the next level, too. He’s a rising junior with more attention to come, and will likely be the focal point of Dallas Skyline’s air attack next season. Davis committed to SMU in late 2018 over a trio of offers that included Kansas and Ole Miss. Now that more attention is headed his way, it’s possible he backs away from the Mustangs pledge. He still has two years before he has to sign, and a lot can take place between now and then. Again, with the caveat that a lot can change between now and the winter of 2020, when he’s first eligible to sign, Davis currently stands as a three-star recruit but unranked nationally and locally, for now. 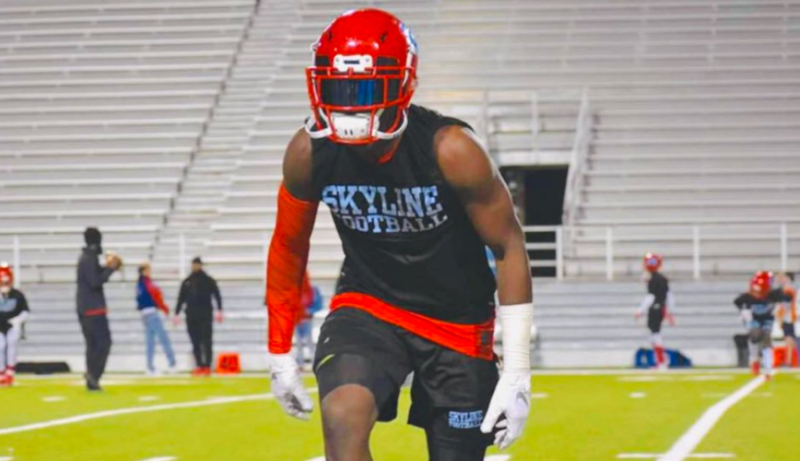 The crop of talent in Texas is pretty loaded overall in 2021 with nine five-stars to date, and Davis is likely going to slot somewhere on the back end of that as a high four- or low five-star.